Last time Air France updated its logo was about 25 years ago, back in 1975, but a lot happened since that logo revision and the company has managed to become one of the largest and most recognized airlines in the world. The previously French government-owned company was transformed into a private corporation called Groupe Air France. On May 5, 2004, Air France merged with KLM and officially became Air France-KLM. This merger created the largest airline in the world in terms of operating revenues, and third-largest in passenger kilometers. After so much growth it was a time to renew the brand identity to reflect Air France global direction. Air France hired BrandImage to execute the redesign. Curiously, one of the main steps of the redesign has been the union of the two word of the brand name into one (a bit of confusion or the start of a long run strategy?). It has to be said that typography and colors are very beautiful, they produce a more sophisticated aesthetic and really worth the upgrade. The old stripes are gone (useless), and in their substitution there is a new simpler ribbon-like icon. When in 1933 Air France was formed, it was a group of airlines that associated together to form the initial company. 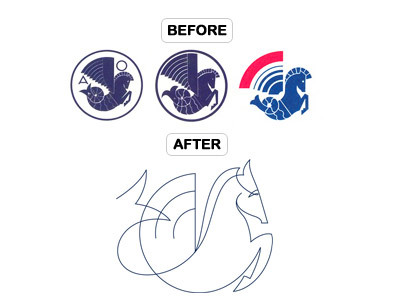 At that time, as their primary insignia, was chosen the logo of one of those companies, the Air Orient sea-horse logo, which official name became the “hippocampe aile”. As part of the updated brand identity, the hippocampe aile was transformed into a wireframe and will likely be used as a backdrop behind the new logo. » Who delivered the trojan horse?